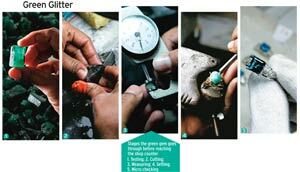 The Jaipur auction ensures this global polishing centre gets a regular supply of emeralds. It happened 20 years ago, but the memory is still fresh for Sanjay Kasliwal, owner of Gem Palace, one of Jaipur's best known jewellery stores. The late Princess Diana visited his shop and was fascinated by an emerald necklace his craftsmen had made. "She said: 'I'm an emerald girl'," says Kasliwal. "She never bought the piece but I still remember the way she kept looking at it." There are hardly any emerald mines in India. Most of these gemstones - comprising the mineral beryl, usually coloured green because of traces of chromium and vanadium in them - come to India from Zambia or Brazil. 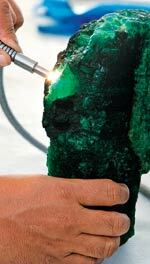 Yet Jaipur is to emeralds what Surat is to diamonds: most of the world's gemstone cutting and polishing happens in Jaipur. Overall, around nine of 12 rough emeralds from Zambia and Brazil are cut and polished in India. "We have been in the jewellery business for four centuries," says Kasliwal. His forefathers were among the artisans and craftsmen the then Maharaja of Jaipur Sawai Jai Singh II invited to the city in 1728 to grow it as a trading centre - the step that would eventually make Jaipur a key global emerald polishing region. Experts in the trade reveal that until as late as the 1940s, emeralds were just as prized - and as expensive - as diamonds. But the marketing blitzkrieg launched by the diamond mining companies, especially global leader De Beers, saw diamond prices surge. "De Beers took the lead with marketing campaigns using smart lines like 'diamonds are a girl's best friend' and 'diamonds are forever'," says Dev Shetty, Chief Financial Officer, Gemfields, a leading global gemstone mining company. Both lines were taken from well known Hollywood movies of the time. "Marketing took diamonds to the next level," he adds. In comparison, emerald mining and marketing remained low key and confined to pockets. In the last two years, however, companies like Gemfields and TanzaniteOne have realised the advantages of large scale gemstone mining. Gemfields explored 43 sq km of emerald mines in the last financial year. This is its third auction in Jaipur, having started in March 2010, but it plans to hold one every quarter in the city from now on. "The Indian market loves Zambian emeralds," says Shetty. Samiullah, who uses only one name, has been in the business since 1975 and was the highest bidder at the emerald auctions held in Zambia between 1996 and 2006. He is often invited to be part of Gemfields bidding process. The November auction saw him seated in a cubicle amid sacks of rough emeralds, studying each one. "We check the colour, shape, size and clarity," he says. The rough emeralds are graded according to their size and quality and placed in different cubicles or tables for the bidders' inspection. 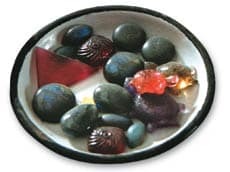 Baby oil is rubbed on the surface of the stones to bring out their lustre better. Every stone has a reserve price. In this five-day-long auction, bidders usually spend the first two days studying the gems on offer, before slowing honing in on, and bidding for, the ones they want. Unlike the diamond trade, which has Rapaport standard to determine prices, the emerald market is a free for all. Bidders have to simply rely on their eyes and past experience to judge emeralds they buy. Thus the importance of the auction, which also ensures Jaipur a regular emerald supply. ALSO READ: Is Surat losing its lustre? But obviously, Jaipur's gemstone merchants do not confine their buying to just the auction. Samiullah, for instance, frequently travels the globe, shopping for rough emeralds. But in the absence of fixed standards, the effort tests his negotiation skills each time. "On average, I travel a week every month but it is not physically possible to tap even the 2,500-plus markets in Africa," he says. "But auctions are so much easier to deal with. Shetty of Gemfields estimates that 50 to 60 per cent of India's gemstone export, excluding diamonds, comprises emeralds.